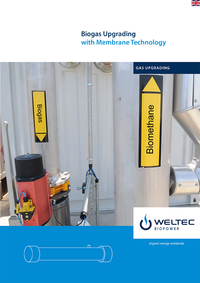 In addition to the conventional use for the production of power and heat, biogas can be upgraded to natural gas quality and be fed into the local natural gas grid as biomethane without any additions. Or it can be used as fuel for vehicles. This is a future-oriented, lucrative step towards sustainable, eco-friendly energy supply. Various proven practices and technologies are available for the processing. The selection and arrangement of the necessary technology depends on project-related technical and economic conditions. In 2008, we built one of the world's largest biomethane parks - where the gas is treated by means of amine scrubbing. In our current projects, we are using mainly membrane technology. This is also suitable for smaller plants.